There are currently 4 different roles for teams with varying permissions. This role belongs to the email account that originally signed up to Stratumsphere and created the organization. This role has full access to everything on the platform. This role cannot be changed. This role is capable of performing all actions that the owner role can, except that it cannot delete the organization or change the owner account. Utilize this role only for staff within your organization that you trust 110%. This role is intended for staff that are in a supervisory position within your organization. 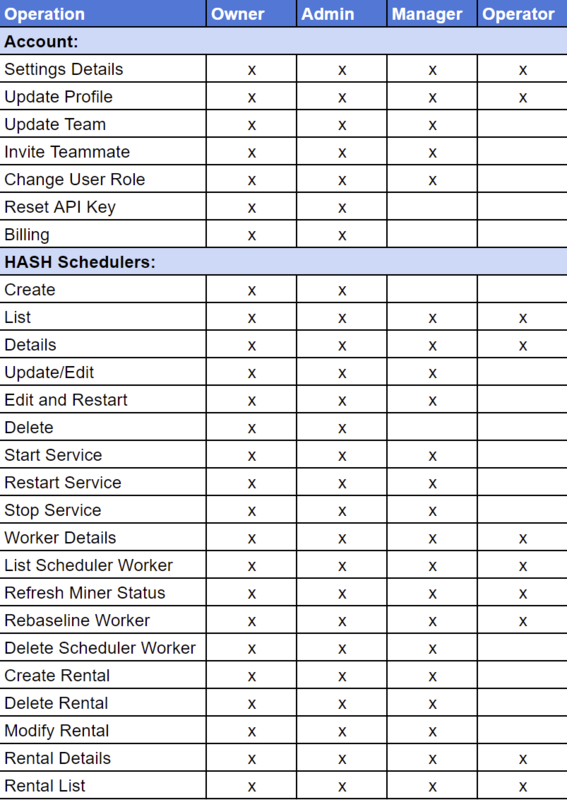 They can perform most actions that admins can except that they cannot access Billing, API or Create/Delete HASH Schedulers. This role is intended for staff that only need limited access to the platform to conduct their duties. This role can see scheduler and worker details, but they cannot add/edit/delete rentals or make drastic changes that would break the operation. Typically this role is reserved for on-floor technicians or level 1 support staff.